We utilise our pragmatic, results-focused services to cover all aspects required in transforming to an agile delivery approach and support any ongoing management activities. Delivery – Combining our real world experience and expertise in applying a proven, robust & scalable agile delivery framework; we ensure all project and development life cycle elements are covered to deliver tangible business benefits. Cultural and organisational change consultancy – In some organisations transformational work may extend to incorporate cultural and organisational change. This includes working with team members in the organisation to prepare them for change, helping to ensure that when change arrives they feel confident to contribute effectively, supporting embedding the change and making it a success. These services help to achieve the successful transformation adoption that result in consistently high performing project deliveries. We also recognise that every environment is different and therefore we work pragmatically and collaboratively with organisations to adapt the project delivery approach and services required to meet an organisations objectives. In all cases of transformational change we aim to deliver tangible benefit metrics that demonstrate the significant improvements achieved in efficiency, staff motivation and project performance. They help demonstrate improved business results and support successfully embedding the change within the organisation. Using our independently accredited expertise and experience in agile project delivery and software development we then apply and adapt the proven, robust and scalable DSDM Atern agile framework. This framework could be applied to almost any type of project delivery within an organisation, not just focused on software development or IT solution delivery. We believe that the introduction of any change should wherever possible be inclusive to help gain commitment in order to achieve the desired business results. Introducing an agile approach is no different. There are a number of different approaches to agile but only DSDM Atern has a defined framework to include everyone in the life cycle delivery process. Also DSDM Atern places a clear focus on end user involvement and business results throughout, ensuring solutions are delivered that meet the expectations, deliver earlier return on investment and therefore achieve the objectives of the organisation. What does this mean to you? Well it means that your investment in introducing agile to your organisation is highly likely to succeed. With strong collaboration and empowerment team members feel a strong part of the change and each agile project. They therefore demonstrate strong commitment to the initial change and also to the solution each project subsequently produces. It means rather than primarily being a change to improve productivity in a technical department (like many agile approaches), it has a broader and more powerful contribution that improves both performance and resulting solutions, generating significant business benefits across the whole organisation. This can best be summarised by the DSDM Atern Philosophy below. Any project must be aligned to clearly defined strategic goals and focus on early delivery of real benefits to the business. This is best achieved when key stakeholders understand the business objectives, are empowered to an appropriate level and collaborate in order to deliver the right solution. The solution will be delivered in the agreed timescale, according to priorities set by the business. The stakeholders must be prepared to deliver a fit-for-purpose solution. They must also be prepared to accept that change is inevitable as they understand more about the solution being developed. 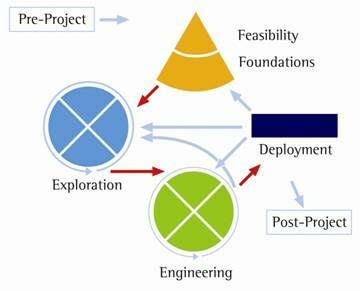 The Atern framework is the latest revision of DSDM that have been evolving since 1995 as a proven, robust and scalable agile framework that can be applied to IT or non-IT related projects. The framework provides comprehensive intuitive guidance and best practice about agile project delivery and solution development. However it is not rigid and recognises that every organisation and every project is different. Therefore the framework is tailored to suit the organisation and to each project. When introducing the agile approach or when initiating a project, the framework provides the best practice that is used as a solid grounding in agile principles, roles, products, processes and techniques that can be applied and adapted to ensure its effective and successful use in your organisation. Not all projects will utilise the full DSDM Atern framework but…. 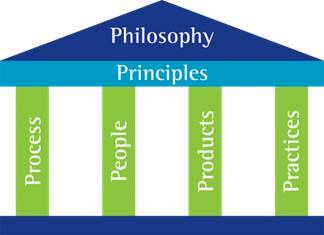 The eight principles support the Philosophy. They provide direction to the team in the attitude they must take and the mindset they must adopt in order to deliver consistently. Describes an outline of the complete life cycle including the early planning phases and how iteration is incorporated into the life cycle. 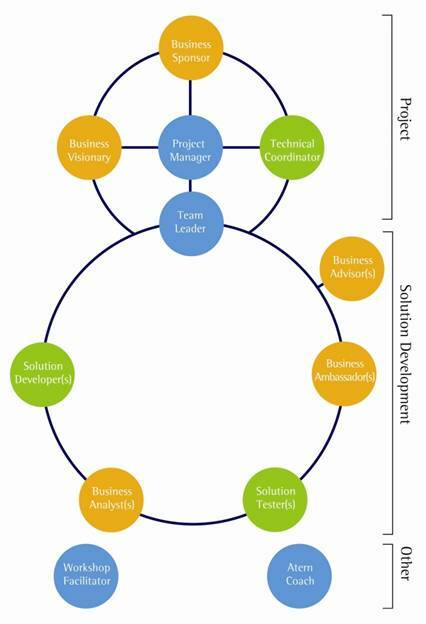 It is important to include representatives from all stages of the project life cycle with a key focus on business needs and acceptance. This enables business requirements to be clearly communicated, defined and verified by continuous testing & quality assurance throughout the life cycle. The result is a fit-for-purpose solution delivered quickly to the organisation that generates an early return on investment. DSDM Atern focuses on the creation of products as a guide to progress rather than meetings, reports or unnecessary documentation. In addition to the solution that the project is producing, there is comprehensive guidance on the different products to be produced throughout the life cycle. Again this would be adapted to suit your organisation but you can be assured that DSDM Atern provides a structured approach to solution delivery. It also remains true to agile principles by ensuring that only an appropriate level of documentation is produced that add value to the project and organisation. DSDM Atern defines 5 core practices to be used in order to support successful agile project delivery. This provides a link to the DSDM Consortium who are a global non-profit organisation. They own and develop the DSDM Atern agile approach through real world feedback from consultants and end users but do not get involved directly in providing implementation consultancy, training and coaching.